Humidifiers can have many benefits for you and your home in the fall and winter. The trick is finding the right balance of humidity. Dry air can trigger allergies, cold, flu, and snoring, so we recommend a humidifier to fight those and other ailments and effects on your home. Too much humidity can lead to a whole host of mold-related problems – and RestoPros can solve them! Continue on to read the benefits of a humidifier. In the winter, you turn on your heater and the air starts to dry out. Along with the air your skin, hands, lips, and eyes can all get very dry. 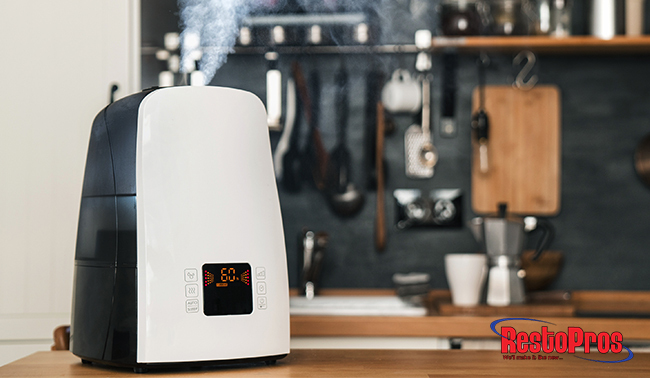 A humidifier can add an invisible mist to the air to add moisture and prevent some dryness. If you already have cracked hands or lips, we recommend trying your favorite lotion or hand cream! With dry air your system has a harder time functioning, meaning your sinuses don’t drain properly. Humidifiers can help correct the drainage issues and in turn prevent cold and flu. Unfortunately, if you already have a cold or flu, you’ll need to rely on a doctor’s advice to cure it! Snoring can be triggered by many different things. Dry air can dry out your airways and cause you and your partner to begin to snore. Adding a humidifier to your home will introduce moisture to the air, and you’ll sleep soundly in no time. Just like spring, winter comes with its own set of allergies. The dry air your heater creates in your home, partnered with closing your windows and blocking out fresh air, causes the same air to circulate in your home. If you have wallpaper in your home, you want to be sure to have a humidifier in the winter so that it doesn’t peel. Your wooden floors or furniture can crack without some humidity in the air. -Recommended humidity levels are usually somewhere between 30-50%. -Refresh water frequently. Humidifiers use about a gallon of water daily, so to avoid mold and bacteria, change the water and wash the buckets a few times a week. -Change the filter at least every month, if not sooner. In the same way that your HVAC filter can get clogged if it’s not changed frequently, the humidifier filter can get clogged and eventually will contribute negatively to your indoor air quality. The moisture a humidifier adds to your home alleviates a host of issues, introduces positive particles to the air, and can make your home an overall more comfortable place to live. However, too much moisture can lead to mold and other issues, so you need to be careful to watch how much you use. Whether you’ve begun to realize that mold is present, or if you’ve got any other type of moisture-related issues, give RestoPros a call at 855-587-3786 for the best remediation services in the Plano area!